by Betsy: Um...there are bats in my Unbatz! Um...there are bats in my Unbatz! 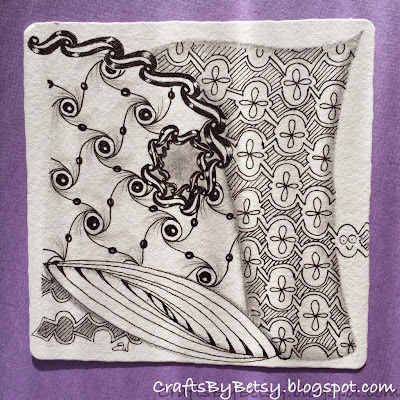 This week's Diva Challenge is UMT (use my tangle) Unbatz by Sandy Hunter. As I was drawing my little horse shoes, I unintentionally (don't really want to use the "m" word) drew beyond my pencil frame line. I kept going, finishing the rest of the pattern, wondering what to do with that little glitch. And of course I saw the bats looking back at me from the pattern, so I decided a bat needed to break free! If you can't tell that's a bat, then you're just not using your imagination! I liked it so well, I let the bottom left corner go past the limit too! So that goes to show that a mistake, nope I mean unintentional line, can turn out to be your favorite part! I also used tangles Paradox (with some rounding) and of course Cadent since I can't seem to stop drawing it lately. It's there with a modified Beadline, and as a border. Both influenced by Margaret Bremner's post. If you missed my Cadent Bijou paint chips, check them out here and you'll also find the link to Margaret's original post that started my Cadent addiction. Be sure to check out the other Unbatz at The Diva's blog. I love your little escape artist there, Betsy. Yup, no mistakes ever LOL! Booyah! Let's hear it for drawing outside the lines! Wonderful depth here! Great shading and highlighting! I like it! Your little bat is so cute and fun. Very pretty tile. Sometimes a 'mistake' is exactly what is needed. Doesn't always feel like that at the time. But I love how you solved it. Awesome tile! Love the un-Batz in your tile!! Zendala Dare 100 but first for me!